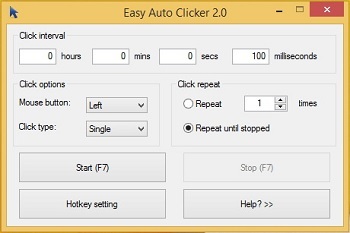 A free auto clicker which will easy to solve all your clicking needs, do you need a head start at a game? Well choose between right and left mouse clicks and even choose the time delay between each click all on one small simple application. Choice of buttons or hotkeys. In-Built program to test it out. Can change the settings to click after a certain delay. Choice of right or left mouse click. © 2010-2016 easyautoclicker.com. All Rights Reserved.